Almost all automotive air conditioning systems work in the same way. The basic principle in the refrigeration cycle is known as latent heat vaporization, which is the process of a liquid changing into a vapor. Refrigerant (Freon) is circulated through the system by a compressor. For decades, A/C systems used refrigerant called CFC-12, commonly referred to as R-12. Then, starting in the early to mid 1990s, vehicle manufacturers all went to the standard HFC-134a (R-134a) because it’s less harmful to the atmosphere. Anytime you’re installing or diagnosing an A/C system, it’s very helpful to have a basic understanding of how the system operates. This guide can be used as a general overview on common street rod air conditioning principles. Let's look at how the A/C system normally operates. •Think of the A/C system operating in a continuous loop that is split into a high-pressure side and low-pressure side at the compressor. Once the compressor clutch engages (suction and discharge cycle), it compresses the low-pressure refrigerant gas into a high-pressure gas. •The high-pressure gas flows out of the compressor into the condenser, which is usually located in front of the radiator. The purpose and function of the condenser is similar to the cooling system radiator, which removes heat from the high-pressure gas. •Inside the condenser, the high-pressure gas changes (condenses) to form a high pressure liquid as the heat from the refrigerant is released to the air. •The still-highly-pressurized liquid then flows into the receiver-drier, which contains a filter to remove any debris within the system as well as any moisture or impurities from the refrigerant. Any moisture combined with refrigerant can form a corrosive acid harmful to the system. •The purified liquid refrigerant flows through the A/C hoses into the cabin of the car, where it travels through a small orifice called the thermal expansion valve. When the high pressure of the liquid drops, it causes the refrigerant to vaporize. •The resulting fine mist is metered by the valve and flows into the evaporator located inside the heater box under the dash. The drop in pressure caused by the expansion valve or metering valve causes the refrigerant to vaporize as it moves into the evaporator, which absorbs heat in the process. • Air is blown through the evaporator by a blower motor which is also located inside the heater box. The air is then cooled as the heat is removed and transferred to the refrigerant and cool air travels into the passenger compartment. When assembling or installing an air conditioning system on a hot rod or other specialty vehicle, you'll want to familiarize yourself with the key components and their functions. Let's take a look at the major components to an automotive air conditioning system. The basic function of the compressor is to circulate refrigerant throughout the A/C system. Most compressors use a piston-in-cylinder design with intake and discharge strokes that draw in, compress, and discharge refrigerant. The essential part to consider when purchasing a compressor is its capacity in relation to the rest of the system. Bigger is not necessarily better, in many cases running too large of a compressor can result in decreased cooling and component life due to excessive pressure. In almost all applications, an 8 to 9 cubic inch displacement compressor is enough to cool large passenger compartments efficiently. 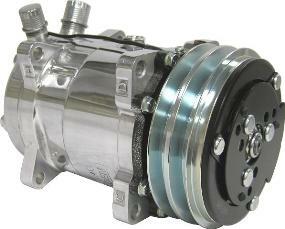 The most commonly used aftermarket compressor is the Sanden type 508. The efficiency of the condenser is probably one of the most important aspects to the a/c system. Its performance will determine how well the A/C operates. 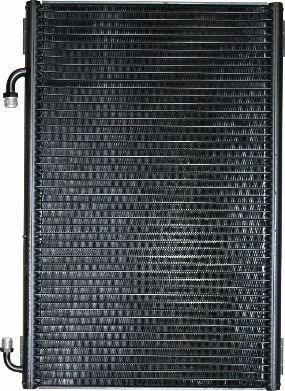 Ideally you should try to use the largest and most efficient condenser that will fit under the hood. With custom applications like street rods, the amount of space will sometimes be limited and vary, so careful measuring is a must. Since space can be a premium on pre-1950s rods, a good high efficiency aluminum condenser can help make up the difference. Airflow is as important as size, you can install the biggest condenser that will fit, but it can only perform as well as the amount of airflow it receives. Always try to mount the condenser in front of the radiator with at least a 1/8-inch gap to prevent heat transfer from the radiator. The job of the receiver-drier is to filter the refrigerant and remove any moisture or contaminants before it enters the evaporator. This ensures that only liquid refrigerant passes through expansion valve. There is desiccant material inside the drier that is used to absorb moisture, so always be sure to leave the rubber caps installed until it's ready to be connected. The drier is often mounted near the condenser, but it can be mounted near the firewall or anywhere in the system as long as it's away from high heat sources. The drier will benefit from a steady supply of fresh air, which ensures that the liquid refrigerant doesn't heat up and cause evaporation. The drier is flow sensitive and will always come marked with an inlet and outlet source. It should always be mounted vertically to separate any liquid refrigerant that passes through from the condenser. The function of the safety switch is simple: it works by opening and closing the electrical circuit to the compressor. As long as pressure in the high side line (between the condenser and evaporator) is within safe operating range, the safety switch will keep the electrical circuit closed. However, when pressures rise above or fall below safe levels, the switch opens the circuit and shuts the compressor off from cycling. A binary switch is used for any vehicle with a mechanical fan and simply shuts down the compressor, but a trinary switch has an added feature. The trinary switch is used anytime there is an electric fan installed. When pressures start to rise, the trinary switch will engage the fan to bring additional air across the condenser to lower high side pressure. Both the trinary and binary safety switches can be mounted anywhere in the high pressure line between the condenser and the evaporator. Some may choose to mount the safety switch behind the dash near the evaporator to hide it from view for a clean appearance. Speedway also offers receiver-driers with a built in binary switch to make installation easy. The expansion valve is attached to the inlet of the evaporator and it controls the amount of refrigerant flow into the evaporator. It does this by controlling the flow of the refrigerant based on the temperature at the outlet of the evaporator, which is measured by a temperature-sensing bulb and tube. When the outlet of the evaporator is warm, the opening allows refrigerant to flow into the evaporator. As the temperature at the outlet of the evaporator decreases, the sensing bulb and tube cause the expansion valve to restrict the flow to the evaporator. The evaporator coil looks like a small radiator that’s housed in the heater box located inside the vehicle. It works to transfer heat from the air to the refrigerant flowing through it. Heat from the air causes the low-pressure liquid inside the evaporator to evaporate into a low-pressure gas. It’s often difficult to redesign your dash around A/C components, so the design of the evaporator can come into play when determining which unit to use. There are options available that combine the evaporator and heater core for space savings. There are two basic styles of evaporators: under dash and in-dash, and choosing one is usually less about looks and more about how much space is available.